Carlos Romero, an organizer with the Restaurant Opportunities Center of Chicago, speaks at a panel discussion Thursday. NU Real Food, a group that advocates for fair, sustainable food sourcing, hosted the event. Food service workers and community organizers spoke Thursday about fighting for workers’ rights to create a fairer, more sustainable food industry. The panel, “Who’s Behind Your Food: A Food Chain Worker’s Panel,” allowed workers to share their stories from the workplace and answer questions from students. Hosted by NU Real Food, Northwestern University Community for Human Rights and NU Political Union, the panel featured six speakers. Carlos Romero, an organizer with the Restaurant Opportunities Center of Chicago, explained that environmentally friendly food requires addressing unfair labor practices first. “Food sustainability is not possible without labor sustainability,” Romero said. Educating people about this dynamic is what NU Real Food aims to do. Co-founded last spring by Weinberg senior Colleen Fitzgerrell, the group is NU’s chapter of the national Real Food Challenge, which uses four components — humane, fair, local or community-based and ecologically sound — to define “real food.” People are often unconscious about the background behind their food, viewing food as simply materializing on their plate, Fitzgerrell said. The panel, part of Food Day programming, focused on the “fair” aspect of real food. Workers told personal stories of discrimination, unfair conditions and physical and mental abuse and of rallying their coworkers to bring about change. 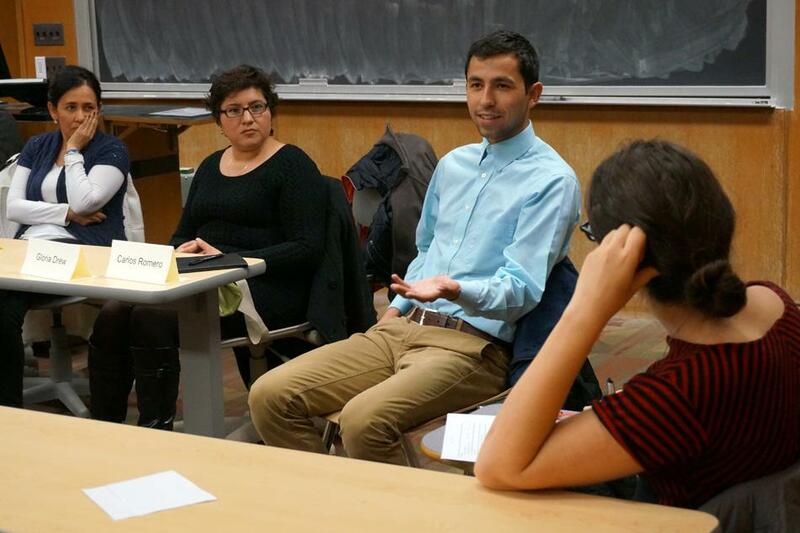 Adam Yalowitz (Weinberg ’11), a panelist and organizer with UNITE HERE, recalled his time as an NU student coordinating the Living Wage Campaign in discussing how to help workers gain rights. Food Day, a national event, began at NU last year when students interested in these issues decided to organize discussions, demonstrations and a panel on food access. NU Real Food and other organizations have since taken on the responsibility of putting on the program, Fitzgerrell said. Weinberg junior Alexi Stocker attended because of his interest in the economics side of social justice issues. Besides supporting workers’ rights, NU Real Food’s main goal is to work with Sodexo to figure out exactly how food gets to our dining halls. Finding the percentage of real food presently served in cafeterias will allow the group to push University President Morton Schapiro to sign onto sourcing at least 20 percent real food by 2020, Fitzgerrell said. Weinberg sophomore Kara Rodby, the group’s spokeswoman, said this task is already underway. “We’ve started doing research on the food that’s served right now and started looking at key administrators who might be involved with this process later down the line,” Rodby said. Rodby, who joined NU Real Food last spring, said she believes it’s important to expose NU students to this issue because we should have control over what we eat and have the ability to affect change.